e-Path is a web based educational resource to support medical and non-clinical scientists in life long learning, particularly trainees. It is delivered in partnership by the Royal College of Pathologists andHealth Education England e-Learning for Healthcare (e-LfH). 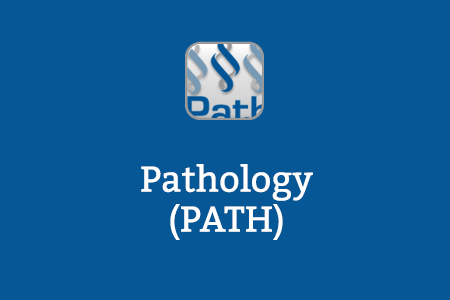 e-Path will continue to develop by adding e-learning sessions over the coming years to support medical and healthcare science trainees in seven main pathology specialties: cellular and molecular pathology, haematology, microbiology, clinical biochemistry, virology, immunology and genetics. e-Path is split into seven modules which contain both knowledge based sessions and cases written by current practicing consultants. A separate Pathopedia tool will allow pathologists to create an authoritative online encyclopaedia of core knowledge. The materials have been designed to be used on a standard laptop or PC via a broadband internet connection at home or in the workplace. As a learner you will be able to plan and record your learning, and return to any unfinished sessions. Histopathology has for many years relied upon the use of preserved specimens (“pots”) showing typical pathological changes to train and teach pathology. These pots are held in a few specialist museums across the UK and form a remarkable archive of disease; some collections hold hundreds of specimens dating back over three centuries. Many show pathological changes of a severity rarely seen in clinical practice today as current therapies often slow disease progression and diagnostic techniques allow diseases to be detected earlier. The e-Path project team has joined forces with Professor Sebastian Lucas at King’s College London and Guys and St Thomas’ NHS Trust to create an online virtual collection using the specimens held at the Gordon Museum in London. These digital versions will be available online and to download as “Potcasts” and will form one of a range of e-learning resources that are used to teach the pathologists of the future. For more information, please go to www.e-pathpots.org.uk. If you already have an account with e-LfH, then you can enrol on to the Pathology programme by logging in to the e-LfH Hub, selecting My Account > Enrolment and selecting the programme. You can then access the programme immediately in the My e-Learning section. Learning section.